Coral Morphologic, a group here in Miami, Florida composed of marine biologist Colin Foord and artist/musician Jared McKay, has a studio that faces a canal by the waterfront. Outside, a motorcade of fishing boats with hulls either sun-bleached or rusting were parked in the Seybold Canal while others drifted lazily toward Biscayne Bay. 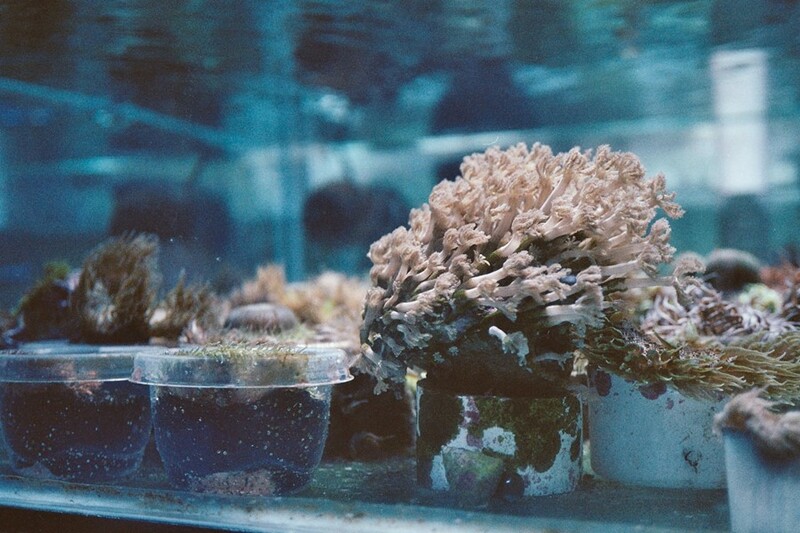 Inside they’ve grown over 3,000 coral colonies in seventeen huge tanks that collectively total about 2,500 gallons. The ripples of the water shimmer on the walls and the ambient lull of synthesizers pour out of a stereo’s speakers: it’s two-eyes-shut short of a dream. Started in 2007, Coral Morphologic has been growing a diverse cast of anenomes, sea fans, zoanthids, stony and soft corals that they film for experimental visual art. The psychedelic fluorescence and baroque ornateness of the corals has been projected onto the sides of some of Miami’s tallest skyscrapers; they’ve shown their work at Art Basel Miami Beach, collaborated with Geologist of Animal Collective, and were part of Lynette Wallworth’s film Coral Rekindling Venus – an official selection for Sundance 2013. Unlike the majority of artists who claim the label “interdisciplinary”, they not only make killer art, they also contributing to a scientific understanding of South Florida’s unique urban ecology. They’ve discovered new species of coral while diving the Miami River and are working to get art-infused restoration projects up and running. The two met as 7th graders in a small town in New Hampshire and they went on to form a close friendship and started to work together – first in a punk band in high school, and then by growing corals in homemade aquariums in Foord’s 2nd floor bedroom. Together they acquired a passion and DIY knowledge of aquaculture through early internet forums and a few mishaps, including the couple times that the aquarium busted and leaked into Foord’s dad’s office on the first floor. McKay, a self-taught multi-instrumentalist who writes original scores for the films that Coral Morphologic creates, moved to Miami in 2007 and the two went back to growing corals in self-made aquariums at the home they share. They funded themselves by cultivating corals for commercial sale and eventually moved into their current studio/lab space, where they run projects such as Discosoma, a music label and a sculpture-strewn restoration of the South Beach reef. The films and visual work they produce are done in a “studio aquarium” at their lab, with results that are visually compelling and backed by droning, profoundly moving synths and samples. Reliant only on HD filming and the naturally surreal beauty of the corals, the art is matched by a diligent scientific commitment to the observation and understanding of the lives they care for. The tanks require year-round daily checking and upkeep that both of them do, and now only recently with a number of student interns from the University of Miami Marine Biology department. The study of corals is not only of interest to scientists and hobbyists – they are living models of how humans may develop new urban environments and social setups. Over thousands of years, corals have matured into huge (and threatened) reef communities that resemble the cityscapes we humans have made. As Jared McKay stated, “The reef and the city are both eat or be eaten worlds. Life is fast and colorful, but can end quick and without mercy. Meanwhile strange symbioses form between organisms you'd otherwise expect to eat each other.” Coral Morphologic believes that much is to be learned from these complex, aquatic life systems. Besides the fact that they serve as critical indicators for global climate change, corals – like humans – are stuck with their environment and must individually and structurally adapt to the transformations that are taking place both globally and locally. There are also the literal realities that Miami is built on ancient sediment of old coral reefs and that much of our city is built from the same minerals found in dead marine organisms. The history of South Florida is one of serious ecological and industrial intervention by humans. The Everglades were drained and the beaches were imported and endless swathes of land were bulldozed, paved, and concretized. Only in the past few decades have people and politicians begun to try and rectify these mistakes, but as Foord said, “We’ve fucked South Florida. It’s about as man-made and engineered as you can get.” Even with all of the development and destruction, Foord and McKay are quick to point out that corals go where humans go – you’ll find stony polyps and soft gorgonians in shipping channels and on the sides of buildings that flank the Miami River and other waterways. Corals don’t only exist in crystal-clear Caribbean waters; they also live in polluted waterways. Coral Morphologic thinks that even while the damage is done, there is a chance for redemption.